We host Macs in multiple high-end data centers. They’re incredible servers that are very reliable. Once installed, you can run whatever services you want and access them from anywhere in the world. Come join us. It's the perfect Mac server. Time to get your data out of the back office or garage. Having your server in a data center will give you the benefits of security, speed and safety. Locations in Las Vegas, Dublin and Atlanta. The Mac minis have proven very reliable with a long life as a server. There are ways to upgrade a Mac mini. We have them available to use or you can send in your own. Once you have a Mac mini installed, you'll be surprised how many ways there are to use it. You might use it as a build server or to run your whole business. Here are 50 other ways to use your server. Some people get hesitant to have their machine out of their reach. Don't be nervous. We've been doing this for a long time. When you need some help, we're fast, experienced, and quick to respond. We've seen just about everything. 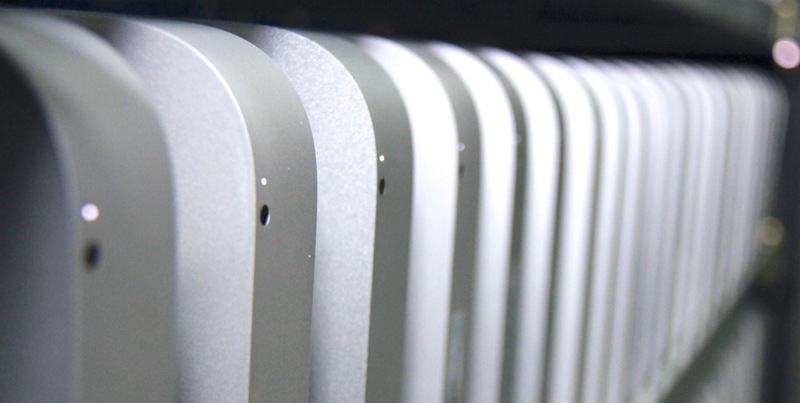 We've been hosting thousands of Mac minis for over a decade. Committed customer service has been a focus for the company and we'll be here when you need us. Send us an email or tweet and you'll get a quick, personal response. In our recent merger with MacStadium, we've created the largest and most capable Mac hosting company in the world. From a single Mac mini to thousands, we can help. When you're done hosting, we'll get your Mac mini sent back to you or help you resell it here. The machines keep their value really well. Many people will host for a few years and then sell their Mac minis and get most of their money back on the resale. Maybe it's not the right time to get started. That's alright. Just enter your email address below and receive a note next time we run a promotion.